dōTERRA xEO Mega Essential Oil Omega Complex is a unique formula of CPTG Certified Pure Therapeutic Grade® essential oils and a proprietary blend of marine- and land-sourced omega fatty acids. Omega fatty acids help support joint, cardiovascular, and brain health, and support healthy immune function. * One serving of xEO Mega provides 900 milligrams of marine lipids (providing 300 mg of EPA, 300 mg of DHA, and 70 mg of other omega 3s), and a blend of 250 mg of plant-sourced fatty acids. xEO Mega also includes 800 IU of natural vitamin D, 60 IU of natural vitamin E, and 1 mg of astaxanthin, a powerful antioxidant carotenoid* harvested from microalgae. xEO Mega is encapsulated in a vegetarian-friendly softgel. Cells are the basic building block of all life. Healthy tissues, organs, and, ultimately, healthy organisms depend on cellular reproduction and specialized function, energy production, and timely cell death when cells are not functioning at optimal levels. As we age, cellular function can deteriorate and we gradually begin to experience decreased energy and performance. 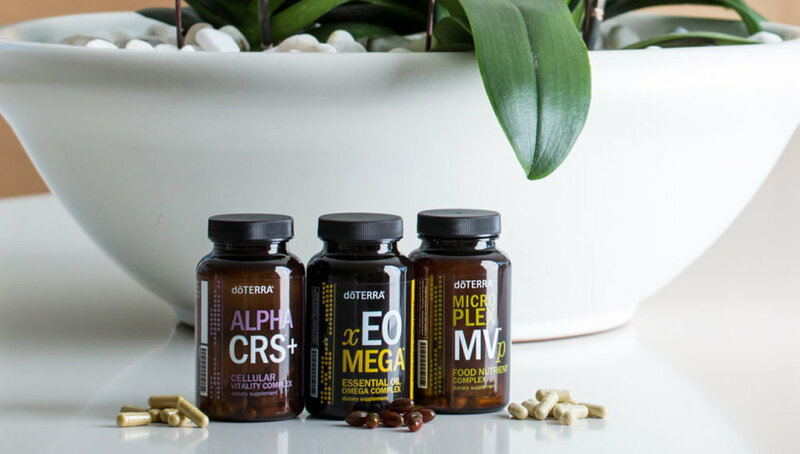 doTERRA Alpha CRS+ Cellular Vitality Complex is a proprietary formula combining potent levels of natural botanical extracts that support healthy cell function with important metabolic factors of cellular energy, providing cells with essential nutrients. Protecting our cells from toxic stressors supports healthy cell function, vitality, and wellness. Save $74.00 when you buy these three products together in this convenient pack!